Did a thing and need to post it somewhere. I-It’s not like I’m reviving this blog or anything! A translation of the BiBi interview from the Love Live! School Idol Festival Official Fanbook. 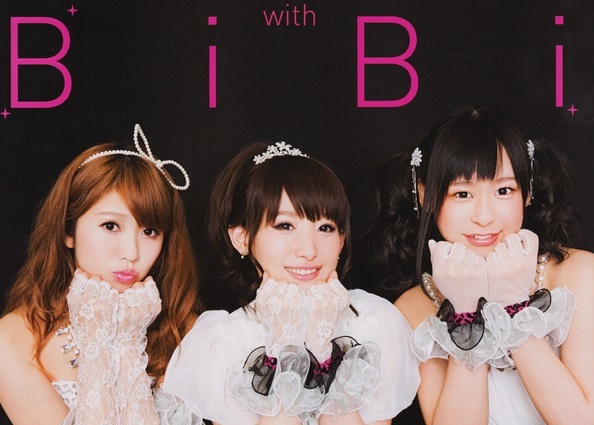 BiBi is a sub-unit of μ’s, consisting of seiyuus 南條愛乃 (NANJOU Yoshino; voice of Eli), Pile (voice of Maki), and 徳井青空 (Tokui Sora; voice of Nico). ― Since you all started playing LLSIF since it first came out, could you tell me about your initial impressions of the game? Jorno: I get what you mean! Even though it’s my own voice I still wanted to hear it [in the game]. Soramaru: Totally! In my case, I got Elichika and Maki-chan, but I didn’t get any Nico… Especially the UR Nico, it didn’t appear at all! Pile: For me, it’s Maki that I can’t seem to get. Even when I get URs, it’s all Nico! All 3: We don’t get what we want! ― Not getting the ones you want seems to be the same for everyone I guess (laughs). So, what do you think are the most appealing points of LLSIF? Jorno: Playing μ’s songs is a big one, but I think being able to hear all the girls’ voices is a huge draw as well. Each member has a different voice that you can listen to, and when you bond max an awakened idol you can read her side story. It’s because of this that I naturally keep playing and leveling up… there’s no end to it (laughs). Pile: Even though it’s a rhythm game where you play while listening to the songs, you can still listen to the songs with the game open (like when you’re commuting) so it’s just like a jukebox. Soramaru: What I want from a smartphone application is lots of talking and lots of cute pictures. In LLSIF, even when it’s downloading something you can keep tapping the characters to make them talk, so I can’t stop tapping them (laughs). Even if I don’t get the card I want, the cute illustrations keep on coming, so I keep wanting to collect them all. Jorno: Plus, the envelopes have different colours when you do a draw, right? Whenever I see a dark pink envelope fly out, I think “It’s here!” and I like this [feeling] (laughs). Soramaru: My user ID is open to the public so when there is a Score Match going on I announce on Twitter that I’m playing right now. I think it’s fun to be able to interact with fans by competing with them [in the game]. ― Earlier Pile mentioned that she plays [LLSIF] during her commute, does everyone also play when they’re on the move? Pile: I play a lot [during my commute]. Jorno: I do play on the train, but I do “muon shanshan” (Note: muted play). ― Wow, muted play! But isn’t it hard to tap to the notes in time when you mute the game? Jorno: Actually, it’s not that bad. Pile: For example the sound doesn’t mislead you? Jorno: Yup. In my head I have an idea of which notes [I need to tap], but when I listen to the song, there’s sometimes a difference between the notes [in the game and in my head]. “Ohh, there weren’t 3 consecutive taps here. It’s actually slower” kind of thing. If I follow the notes inside my head, I can even play it when I’m listening to a different song. Jorno: But I only do that when I’m outside (laughs). When I’m at home I play with all the bells and whistles. Soramaru: I can’t play at all if I don’t put my smartphone on [a table or something stable], so I don’t play in the train and I mostly focus on doing that at home. When I do [play at home] I play with my index and middle fingers. ― Everyone seems to be playing mainly on the smartphone, but do any of you play on the tablet too? Soramaru: When I was filming the LLSIF CM, I was playing on the tablet, but the intensity is quite different! Pile: It’s because the screen is bigger I guess. For me I still feel like it’s easier to play on the smartphone. Jorno: Rippi (note: Iida Riho) plays on the iPad, and during our lunch breaks I would play with Rippi and Kussun (note: Kusuda Aina) and we’d play on the iPad together by splitting it into 3 (laughs). “I’ll take care of these three notes” kind of thing. Soramaru: I’ve also used the iPad mini to play it with two people, but when you play doubles you need to make compromises for the center (laughs). ― Speaking of which, it seems like everyone has been playing a lot, so what rank are you? Soramaru: My rank’s not very high at all! Jorno: I restarted the game once so my rank’s not very high. Jorno: Oh!? Me, I’m Rank 53. Jorno: I guess I actually play a lot (laughs). Plus, I tried really hard to get SS (score and combo rank S) on “WILD STARS” and “Susume Tomorrow” so there are some traces left from that. Soramaru: “Nawatobi” and “Natsu, Owaranaide” are pretty relaxed songs but they’re surprisingly hard. Pile: Anyway [when I play] on Hard I get impatient then I can’t stay in sync with the rhythm anymore and end up going “oi!” (laughs). ― Does everyone play the more difficult songs [in the game]? Jorno: I cleared two Expert songs. soldier game! That one is super hard, isn’t it! Soramaru: In Score Match I get to play songs I haven’t unlocked yet so there I got to play “Sore wa Bokutachi no Kiseki” on Hard, and it was really hard. ― It’s really appealing how all of the μ’s members are fully voiced in LLSIF, but are there any stories or dialogue that left a strong impression on you? Jorno: In Eli’s side stories there were times when she acted very boldy, as if tempting the player [who is reading it], to the point where I was thinking “Huh, did I record this?” (laughs). There was a part about watching fireworks together and in this scene Eli said something like “It would be nice if someone would strongly embrace me…umm…I meant that I want you to do this,” and I thought “Uhh, Eli…what, did I say that?” (laughs). It’s the line that I find the most shocking and it also happens to be a line that I’ve taken to recently. Soramaru: The line that gets me is “Nico no dansu, joozu?” (“Nico’s dance, wasn’t it great?”) which plays when a song ends. I’d like to say “Was I good?” at the end of a live performance too (laughs). I also really like all the short shout-outs that play when a skill activates [during a song]. Pile: I have Kotori-chan as the center of my unit, and when a song ends she says “Susume~ Susume~!”, which I find cute and soothing. ― And finally, can you tell me what are some things you would like to see in LLSIF? Soramaru: I think everyone would like it if there was an arcade version of LLSIF! Pile: I’d like to play that! Jorno: Whenever you put in a coin you could make it say “Harasho!, I think it’d be interesting if it said “Harasho!” (laughs). Pile: And when you stop playing the game it’d say “Nanisore, imi wakannai!” (laughs). Soramaru: You could even limit [the arcade machine] to [use in] gaming conventions only, so please make it. To commemorate (?) the LLSIF interview, each member of BiBi took a stab at the 11-card premium draw. Here are the results! Top-batter is Pile-san. She drew one SR but there was a problem with the equipment so she rolled a second time. The result is as you see in the picture, R only. Unfortunately, second batter Tokui-san also had R only. The SR guaranteed draw had just ended the day before the interview so… oops? And last but not least is Nanjou-san. As staff and members were hoping for, [Nanjou-san] splendidly drew two URs and one SR. Everyone cheered!